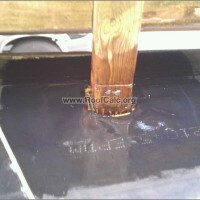 Repairing rubber roofing is a fairly easy DIY job, if you have the right tools and materials. 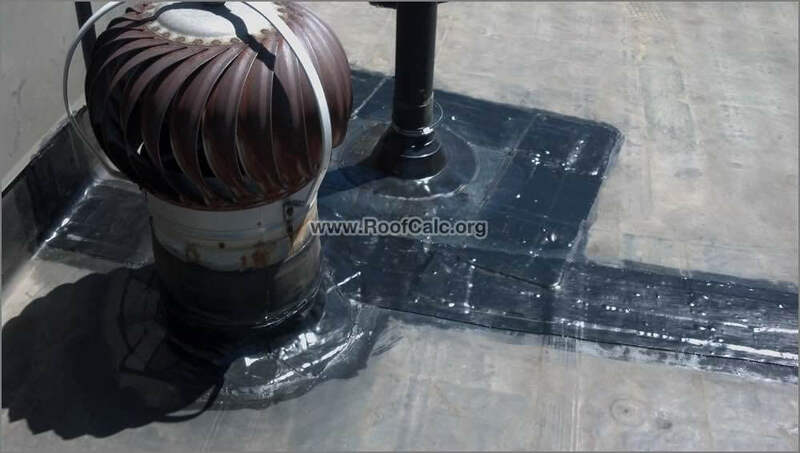 I have been working with EPDM rubber membranes for over 15 years, and in this guide, I will teach you how to fix a leaking roof in just one weekend, all by yourself, for less than $230-280! 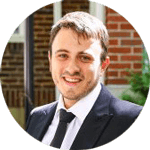 I will also discuss the benefits of doing a DIY repair vs. hiring a roofing contractor, and how much you will be saving. 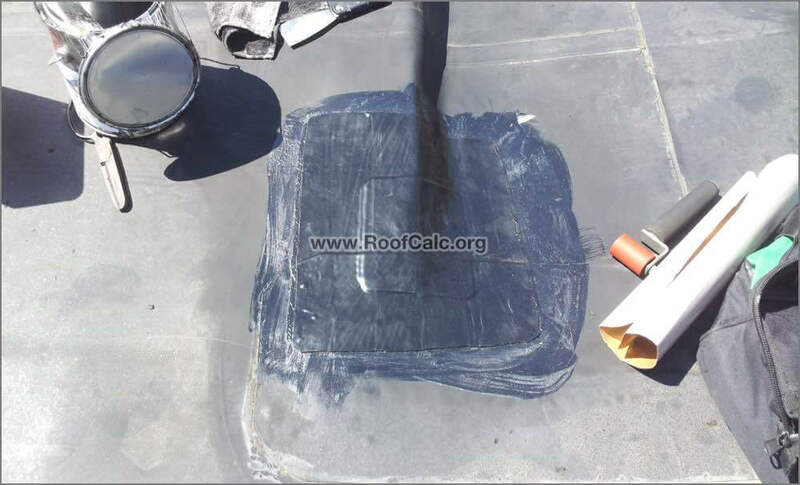 Note:I will also showcase “EPDM Rubber Roofing Repair Kit”, which is a set of tools and materials designed specifically for DIY flat roof repair. 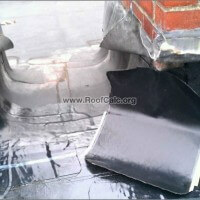 I am the seller and I have put this kit together based on my extensive experience in the flat roofing field. 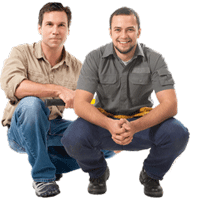 Benefits of DIY repair – what you will gain from fixing leaks yourself over hiring a roofer. Materials and tools – complete list of all the supplies you will need. Where to buy roofing supplies – find out where you can purchase materials, tools and accessories needed for the repair – online and local. 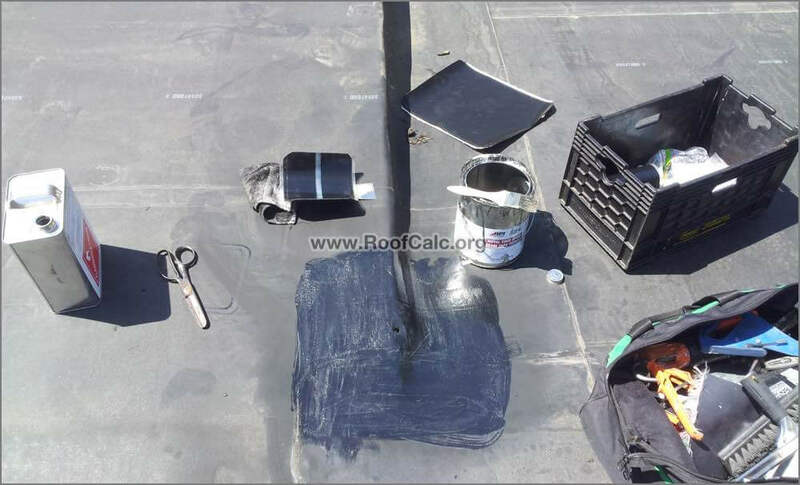 Rubber roofing repair kit – a complete set of materials and tools needed for the job. Costs $259 for a small one or $279 for large. It is shipped to your door for free. 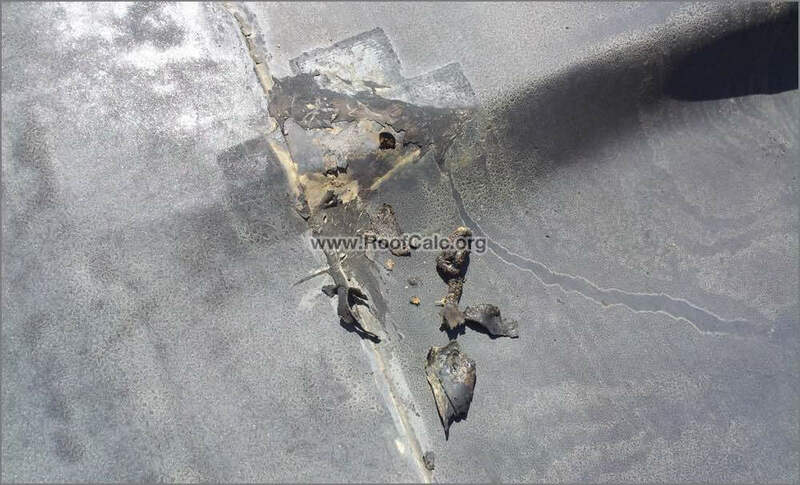 Why should you fix a roof leak yourself? Reason #1 – You can do it, and it’s not that difficult! Reason #2 – You will feel good about the work you did, and can brag to your friends! Reason #3 – You will save a bunch of money (I estimate you will save at least $200-300). Reason #4 – It should only take 3-5 hours of your time (you will “earn” at least $50 / hour). 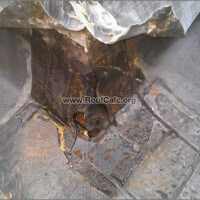 Most important reason: This is YOUR roof, and you care much more than any roofer out there, that it stops leaking! Bonus reason: Nobody ever showed me how to repair or install a flat roof (I was trained to install metal and roof shingles). A Word of Caution – if you do not feel comfortable doing this yourself, you should NOT get started! 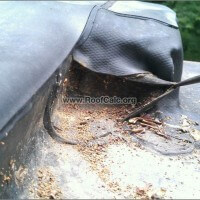 If you open up a roof, can’t put it back together, and it starts to rain – guess what? The roof will leak, and probably more than it did before. BUT … I am a firm believer that most people who are the least bit handy, can handle this, and do a pretty good job! Lets compare the cost of hiring a contractor vs. doing this repair yourself. 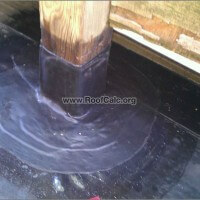 In my experience, residential roof leak repair cost is minimum $400 and can be as much as couple of thousand. For $400 bucks you usually only get a couple of patches done. If the job is more involved, you are looking at $500-800. Commercial repairs start at $750. Commercial can be anything from a small convenience store / gas station roof to an office / apartment building, or a strip mall. Typical cost for a commercial repair is $1200, if you do not have a maintenance contract. 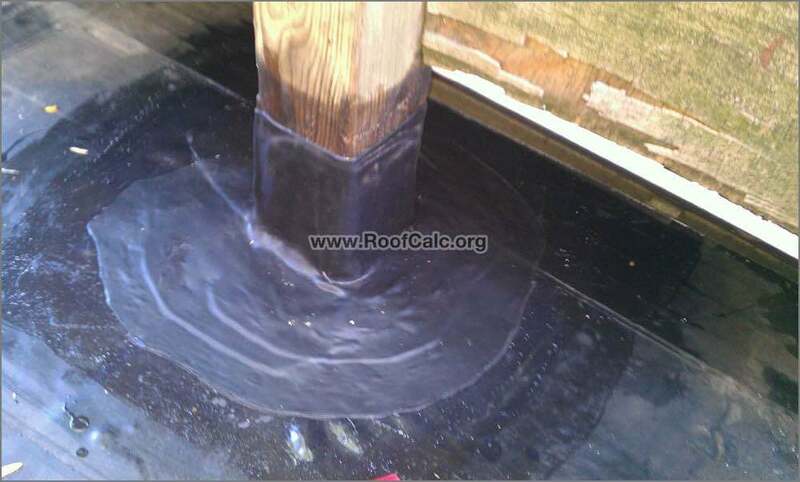 Another thing I NEED to mention – most residential and some commercial roofers have no idea how to properly install or repair EPDM rubber, or any flat roof for that matter. They usually specialize in shingles, and do an odd porch once in a blue moon. The biggest reason why its a challenge to do the job well, is because its time consuming to examine and find all the small leaks in the body of the membrane. 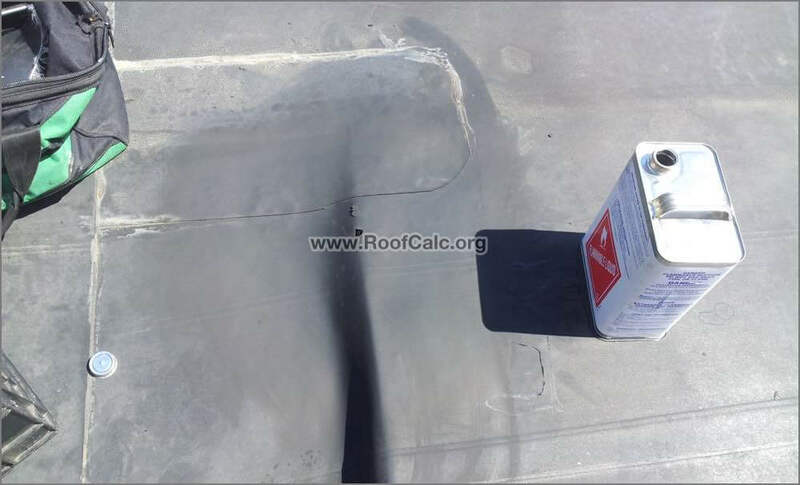 Thus, to do a proper flat roof repair, you actually need an good roof mechanic (commercial roofer) with years of experience. These guys charge a lot more than $400 for their work. 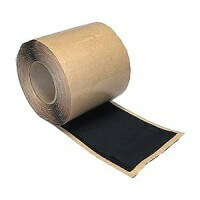 EPDM Patches – 2-6 pcs. Uncured flashing material – this is for patching around pipes, corners, chimneys / skylights / hatches. cannot be washed off by water. 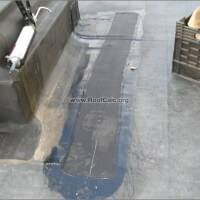 EPDM Primer or glue -this is used to adhere patches and flashing to rubber membrane. Note, I do not use and do not recommend the use of EPDM Glue, because it is an older and not very efficient method. Instead, I use and recommend EPDM Peel and Stick flashing + EPDM Primer method. It has better adhesion properties, holds better and longer than “black glue”. In my kit, I only use Peel and Stick materials. 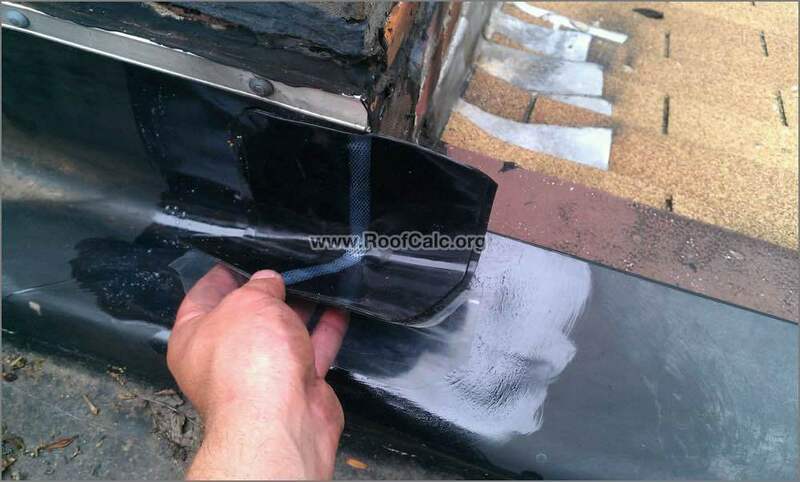 Silicone or Steel roller – used to apply a patch to the roof. Scissors – for cutting flashing to the right size and trimming corners off patches. Paintbrush – used to apply primer / glue. Rags – for cleaning patch area. chemicals used on EPDM roofs. I do not recommend vinyl / latex gloves for this. 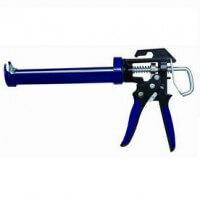 Caulking gun – used to apply lap sealant. expensive, and can be used for MANY projects around the house. Some of these tools you should already have, and others you can buy separately. So even if they do sell to you, you will have to buy a 100 foot roll of 6″ tape or 50 foot roll of 9″ or 12″ tape. Primer and cleaner – one gallon or more. These flashing materials do not come in small quantities, so if you buy a “contractor pack” you will most likely have a lot of tape and flashing left, and nowhere to use it. Other places where you can buy EPDM materials are select Home Depot stores, but these also come in bulk only, and are intended for a bigger job, such as a porch, or a small to medium size roof. I calculated that you will have to spend at least $390 + tax at the Home Depot to buy everything you need for a repair. Cleaner: The cheapest suitable option I found on online is the cleaner spray by Eternabond. This should work for EPDM roof repair, as well as patching small holes with eternabond tape (I’m not a fan of this band-aid approach). 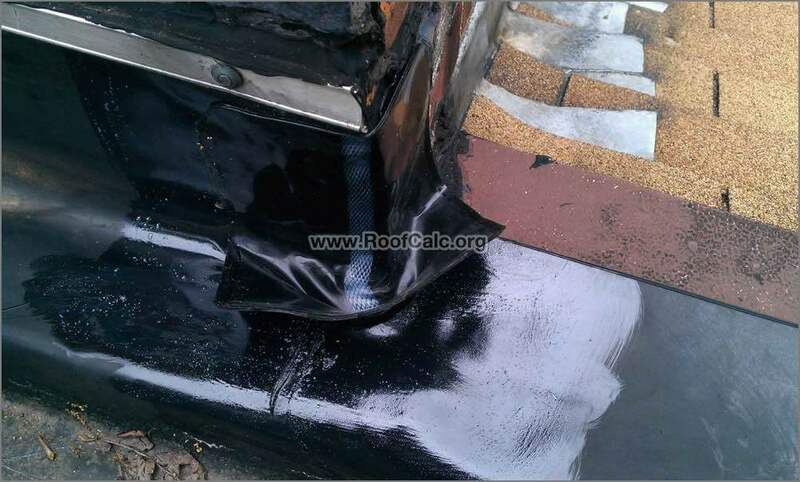 Primer – you need a really good primer to properly adhere EPDM patches / flashing to the roof. Firestone (probably the biggest commercial roofing manufacturer) QuickSeam primer is the real deal, and while it’s pretty expensive, it gets the job done right. This is the product I use on all my repairs! I’ve tried other primers – both from roofing suppliers and from Amazon. They are too thin and do not stick as well as Firestone. Brands I tried and did not like include Mule-Hide, Carlisle, GenFlex (now owned by Firestone). I also tried some of the “quick patch” brands from Amazon – Cofair and Dicor – again, too thin, and do not stick well. 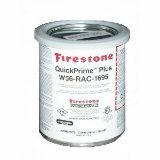 A quart size can (32 oz) of Firestone Primer is $49.48. Flashing and tapes: It’s rather hard to find the right product at the right price online. The latter one has a lot of no name and no reviews products (such as this brand Anjon), which are of the unknown source and unknown quality. 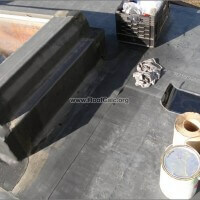 9″ EPDM Flashing: This one is a 9″ x 10 feet CURED (according to product description) flashing tape, which means it CANNOT be stretched, thus cannot be used for any corner patching. However on the product image it says “uncured”, which is confusing. Anyway, this can be used to recover old seams or wide holes. I’m not sure about the quality, as this has only 3 reviews, which could be fake, and the manufacturer is unknown (Quick Roof is a private label). For a repair, you probably won’t need more that 10 feet of 6″ tape, but the minimum you can buy is 25 feet. You should get the Peel & Stick kind. I recommend getting UNCURED flashing only, because you can use it for corner / pipe flashing, as well as flat surface repairs. It does not make any sense to buy both Cured and Uncured EPDM tapes for a small job. Best Materials sells Black EPDM Flashing Grade Tape (6 in. X 25 ft) for $41.94 + shipping. On Amazon you can get a 50 foot roll for $72 + $10.99 shipping. You can also get a 12″ tape, but these are expensive! Best materials sells a 50′ roof of 12″ for $159.95 + shipping. As I mention in the how-to section, lap sealant is optional, but it is a good measure to extend the life of your patch. You can buy it for about $10 at participating Home Depot stores. Amazon sells a Dicor lap sealant for $12.48. This is the most important tool for a quality repair job. All roofers use it, and I recommend using only the heavy duty version (not the cheap plastic roller for wall paper). I usually buy the Everhard brand, but there are other similar products. Best Materials sells one for $10.95 + shipping. Again, I advise you to not buy the cheap plastic rollers made for wallpaper, as they WILL break when you apply enough pressure. Why I recommend Amazon over other sources for the above materials? 1) You get free shipping on most products, if you have Prime or buy $35+ worth of stuff. 2) You can easily return products that do not work for you. Unfortunately, Amazon does not have a good selection of EPDM flashing. As for Best Materials – I use that site every now and then. The site itself is pretty outdated and their shopping cart is “buggy”, but they have better prices than other competitors in the same field. If you want more choices in EPDM flashing tapes, I recommend searching Google for “epdm flashing tape” and click Shopping tab. Scissors, caulking gun, gloves, rags, knife, paintbrushes, etc. Most of these you can buy locally from Ace Hardware, Home Depot, Lowe’s, etc. I recommend using nitrile gloves to protect you hands. You can get these for $3 at Home Depot. Do not buy a cheap caulking gun – it will damage your hand! Also, Home Depot sells a similar, but not as good gun for about $15. It’s orange… But I still prefer the Lowe’s one. 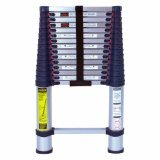 Most likely you already have a ladder, but if you don’t, I recommend a Telescopic ladder for ANY homeowner. It is VERY compact, light, and easy to use – you will love it! I got mine from Sherwin Williams paint store for $259 + tax (15.5 ft telescoping ladder – the longest they had). Target used to sell a 8.5 one for $89, but they no longer carry them in store. Online you can get it for $101, but prepare to pay high shipping, becuase it’s rather heavy. Also, the 8.5′ ladder might be too short to get to a roof, while 15.5″ works in most situations (for me at least). Paint brushes – get the cheapest ones from a dollar store or Home Depot / Lowe’s. You will not be using these again, and they are only needed to apply EPDM primer. Once you are done with them, you can toss them, so it makes no sense to invest in expensive Painter’s grade brushes. SUMMARY: While you can source all the tools and materials yourself, when you do the math, it becomes too expensive to buy every item individually. That is why I have put together a special kit that is designed to have everything you will need for a repair, and will cost less than buying all the items separately. 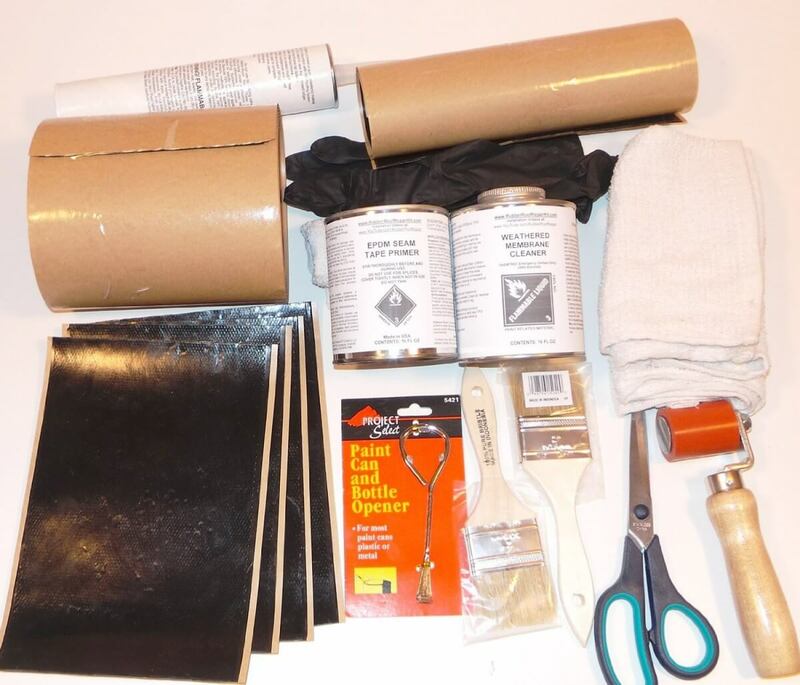 I designed this kit based on years of experience with EPDM membrane repairs. I figured out that 95% of all repairs took me 2 hours or less, and the materials I include should work (will be enough) for most repairs. The kit costs $259 for a standard package, or $279 for a larger package, needed for bigger jobs. The larger one is currently sold only on our website, but will be soon available through Amazon. 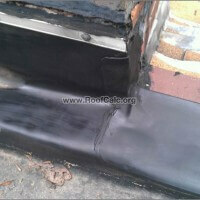 You can also get it directly from our website – www.RubberRoofRepairKit.com. It comes with FREE shipping in continental US, and is shipped on the same or next business day. The most essential part of the job is proper preparation. I recommend that you do the work when outside temperature is 40 degrees or higher. In lower temperatures, the EPDM primer may not cure properly. However, if needed, this can be done even in the winter. I will show you how, below. Another important aspect – your roof must be dry when you do the repair. Patches and flashing material will not adhere properly to a wet surface. You can use a hair drier to spot-dry your patch area. To stop the leak, you first need to find it. 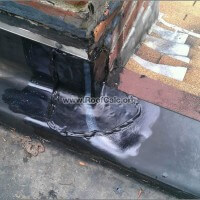 Most leaks occur in certain spots – low water pooling areas, loose seams, on corners of chimneys / skylights. Also, sometimes there are holes in the roof that you will need to find. If you have water pooling on your roof, and there is a seam / overlap going through that area, chances are you have a leak there. 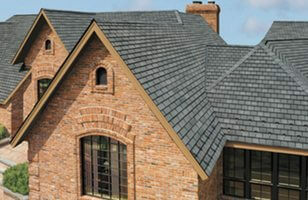 If your skylight or chimney leaks, check the corner flashings. You should sweep all loose debris off the patch area – 5 to 10 feet away. This includes branches, leafs, sand / dirt / dust. Scrape off old sealant, if present. Remove old peeling patches. Next, take a bucket of warm water and wash the surface where you will be applying the patch, going at least 18″ away from the “hole” or seam void. Use a scraper if necessary, but try not to rip / damage the membrane surface. Use rags or a heavy brush to remove dirt. Repeat the process as necessary, until the surface is clean, and let it air dry. If you need to speed up the drying, use a hair drier or a heat gun. Once you remove all loose debris and dirt off the repair area, you will need to use a clean rag and EPDM Weathered Membrane Cleaner (included in our kit) to wash the surface once more. This will remove chalk and further clean the surface, getting it ready for the application of the EPDM Primer. The next crucial step to effectively fix your leaks is to apply EPDM Primer. This and next steps are the most important part of the repair, because if you don’t apply the primer properly, the patch WILL NOT stick! EPDM Primer activates a special chemical in the Peel and Stick flashing, to ensure good adhesion. 1) Using a paintbrush, apply a thick coat of primer with the hole in the center. Go at least 2-3″ outside of the patch dimension (on each side). If your patch is 6×6″, your primer should be applied to an area that is 10×10″ to 12×12″. This is done so you can move / re-position the patch as needed, and that the entire surface of the patch will be applied to the primed area. 2) Allow primer to dry for at least a couple of minutes. When you think the primer is dry, do a “tack and pull” test. Put your finger on the outer edge of the primed area and pull it back – if primer is still wet (sticks to your finger) it MUST dry more. Wait another minute and repeat the test. Make sure it is dry and does not stick to your finger. Do this until you are absolutely certain that it is dry. The above 3 steps are the same for any type of patching. 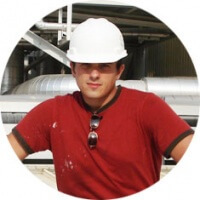 Below, we will discuss patching a field hole where there is a hole in the membrane (easy), patching an outside corner of a chimney / skylight (difficult), and patching seam voids. As you can see in the images above, the hole is in the “field”, meaning leaks are caused by the hole itself, and not by seams or patch work coming off. This is the easiest type of repair. In fact, if this is the only type of “leak” that you have on your roof, and there are only 3-5 of these, you may not even need my KIT. You can get away with much less expensive hole patch kits that cost $16-20. You can even use rubbing alcohol instead of EPDM cleaner for a small job like this. However, if you have many holes and some outside corner flashing that needs to be repaired, the “cheap” kits will not work for you. 1) To apply a patch to a field hole, make sure that your patch is at least 6×6″ for a pea-sized hole. For large holes you will need at least 3″ overlap on each side. 2) Once the surface is cleaned and primed, take your patch and trim corners if necessary (all patches must have rounded corners, to last a long time). Next, remove half of release paper and fold it back. Half of your adhesive surface is now exposed. Try not to touch this surface. 3) Place the patch with half of released tape folded, over the hole, making sure the hole is in the center of the patch. Press the patch down firmly with your fingers, and avoid any air bubbles. 4) Next, remove the remaining release paper, and press firmly with your palm on the remaining half of the patch. Slide your hand from the center out, making sure there are no air bubbles. 5) Now that the patch is down, use a silicone roller to compress the patch with the roof – do a forward and back motion, sliding the roller from one edge of the patch to the other. 6) Using a caulking gun and a lap sealant tube, apply 1/4″ bead of lap caulk around the patch edge. The video below will demonstrate this process in great detail. 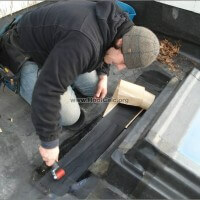 It was taken during a winter-time repair job on an EPDM rubber membrane that was covered with light snow / drizzle. So if you are doing a cold weather or a light drizzle repair job, I highly recommend you watch this. As you can see from this video, it took me only 7 minutes to patch up one hole. Of course, there is setup time, but like I mentioned, patching field holes is the easiest type of rubber repairs. 5. 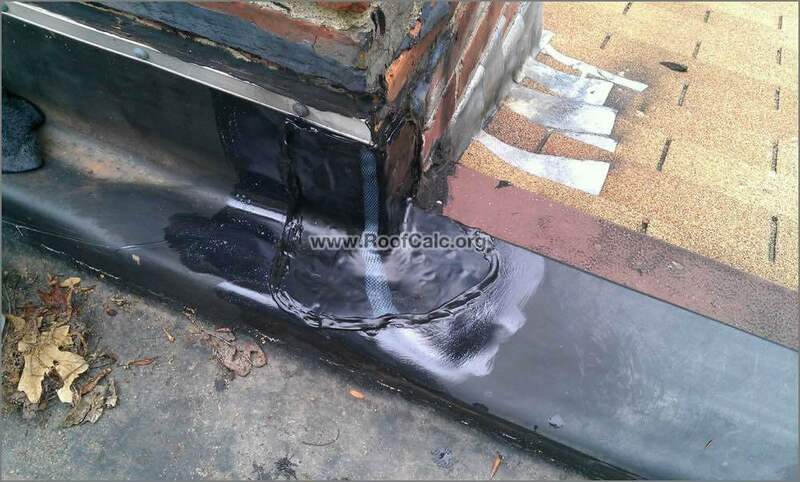 Patching Outside Corners – Skylights, Chimneys, Curbs, etc. Outside corners are much more difficult to patch correctly, if you’ve never done it. You will have to apply a patch on 2 different surfaces, there is an angle change (usually 90 degrees), and you will have to carefully stretch the UNCURED flashing to give it the correct shape. Cut a 6×6″ piece of flashing from a 10′ roll that I provide with the kit, fold back 1/2 of the release paper, position it at the corner of a dresser (with remaining release paper on the vertical side) and try to stretch the exposed material so that it molds to the horizontal part (floor). Now, this video makes it look easy, but it demonstrates a new roof install. When it comes to a repair, you have to deal with OLD flashing that is already in place. 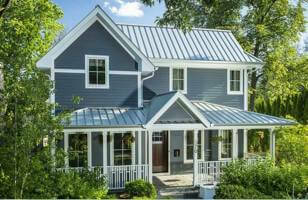 Often, you also have 2 or more roof layers, which makes the roof to chimney angle more than 90 degrees. This can both simplify and complicate a repair. If the old patch is small – 6×6″ or so, you can use a 12×12″ patch to go over it. 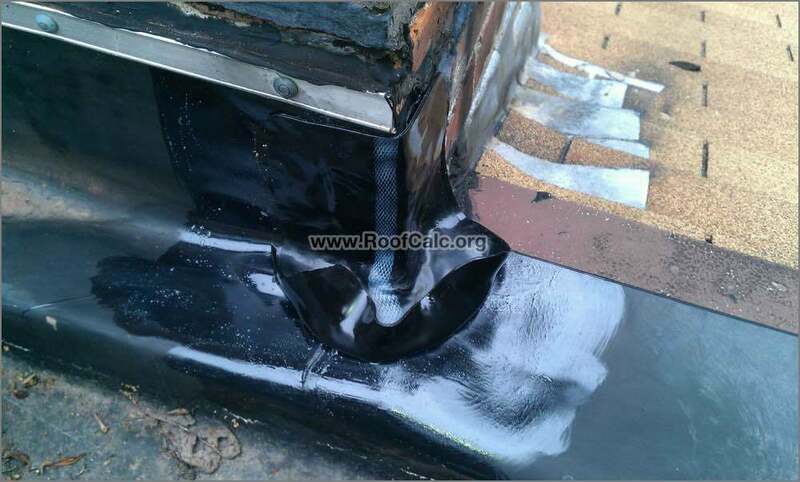 If the existing patch is bigger than 6×6″ or you have multiple old patches, you will need to remove old flashing completely, if you want your repair to work (not leak) and to last long. It is always best to install patches over the original membrane and to make sure there are no additional layers in between, because that complicates installation and poses risk of leaks. The repair above (7 outside corners on 2 adjacent chimneys) took me 3 hours to complete. Most of the time was used to remove old flashing materials and clean up roof surface. Cut a piece big enough to overlap the corner at least 4″. The ideal size for this is 9×9″ or 12×12″. However even 6×6″ or 6×9″ can be used if no old flashing is present. Round off the corners of the patch. 2) Peel back HALF release paper, fold patch in half and apply it over the vertical surface of the curb (one side for now). Fold the patch “around the corner” – now it should be adhered to both sides of the curb, with the other half of patch folded upwards, and not touching the horizontal roof surface. 3) Remove the rest of the release paper / film. Slowly start stretching out the bottom part of the patch. Work your way from the CENTER out. Be careful not to tear or overstretch the flashing. As you stretch it (slowly), press down, against the HORIZONTAL surface of the roof. Make sure you do not trap any air – avoid air BUBBLES. Press hard with your fingers into the corner, where the roof goes from Horizontal to Vertical – this is a CRITICAL part. Be sure that flashing is stretched enough, and won’t pull back. Use your fingers or SILICONE ROLLER to get all air out, and press the patch well. Firmly roll in the bottom part of the patch. Again, make sure you don’t create AIR BUBBLES, and work your way from the center, out. Once both vertical and horizontal parts of the patch are firmly adhered to the roof, apply 1/4″ bead of Lap Sealant all along patch edges. That’s it – you are done! If you can do this part, you can most certainly do most other repairs, be it pipe flashing, or some other odd thing. In a nutshell, this is what you need to do. I hope it makes sense, because it is a little hard to explain in words, and is best to observe. I’ve provided crucial images of each of these steps, but if it’s not enough, watch the video above, and the one below. This video was made 6 years ago, and unfortunately I did not record sound in the original one. I did put a sound overlay later, and hope it came out good. Send me pictures of your repair job and tell me how you did. I what to know if this guide helped you get rid of leaks, how easy or difficult it was, how long it took you, where you got your materials, and how much it cost you. Please also share this with your friends. Thanks, and good luck fixing your roof! 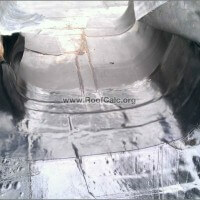 Most important reason: This is YOUR roof, and you care much more than any roofer out there, that it stops leaking! Bonus reason: Nobody ever showed me how to repair or install a flat roof. 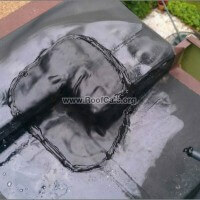 Rubber roof covering will charge low to fix various rubber roofing problems all the supplies you will need. I have a small 8’x8′ rubber roof(EPDM I think) on an addition . I am going to remove a 6″ chimney, the roof is only about 5 years old. How do I go about this, patching the round hole in the wood and then the rubber on top. First, build out the hole left by the chimney with wood/ plywood. If you don’t have access to insulation (you probably have 1/2″ fiber board), just fill in the gap with wood. Basically bring wood to the same level as roof. Next, get a piece of rubber that is 6-9″ wider than chimney hole in Length and Width, so that you have a minimum of 3″ overlap in all four sides. Get 3″ seam tape, and 6″ (better 9″) cover / flashing tape. Install seam tape by priming both top and bottom pieces of rubber (seam tape goes in the middle). Then install cover tape over seams. 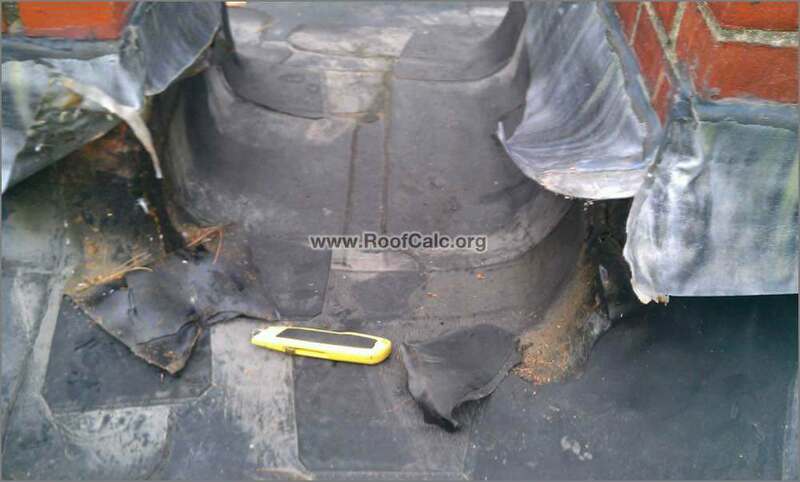 9″ tape will last longer, and is a better chance that roof will not leak, because you have 4.5″ of coverage on each side of seam.